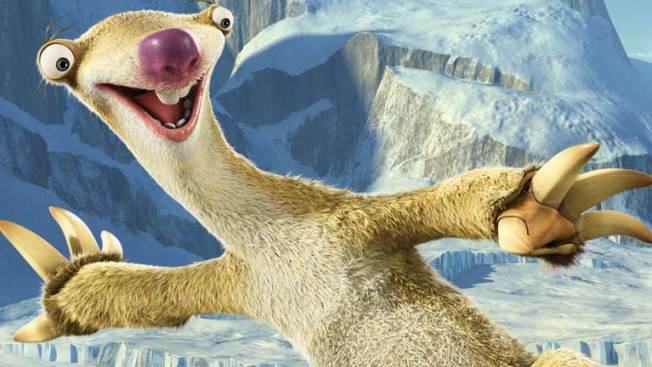 The latest Ice Age game, designed primarily for kids -- is voiced by several of the movie's actors. School’s out for summer and blockbuster movies are in theaters functioning, in part, as babysitters. This is usually the job of the very latest video games, four of which, all with cinematic tie-ins or overtones are detailed in the adjacent embedded video clip. Since many of the summer’s movie hits have also been ported to the game console, it’s worth taking a quick look at a few of the new crop of games designed for the rug rats, even if you don’t have kids so you can be glad you aren’t stuck playing most of these things. One of the summer’s biggest video game offenders is the ‘Transformers Revenge of the Fallen’ game. It’s just as loud as the movie, but sorely missing a human element like a fit ingénue. The control scheme is clunky and the action is repetitive. If you thought the concepts behind Disney/Pixar’s movie ‘Up’ were curious, especially in a film genre geared to kids, then you wont find the game any different. How a poignant, and generally heart wrenching movie could be made into a tedious video game is the main question. As an extension of the film, the game is pretty much a downer. On the flip side, the ‘Ice Age: Dawn of the Dinosaurs’ game from Activision, designed primarily for children around the age of 10, is actually a cut above. Voiced by several of the movie’s actors, the cut scenes move the action along setting up some semi-challenging adventures. Also, for the first time in an Ice Age game, players can team up with friends and family for a variety of multiplayer mini-games. Perhaps, the most cinematic game of the summer is the one that isn’t licensed from a movie or geared to kids, but nonetheless is a prequel to the first Call of Juarez game, and just like films in the Western genre it’s been made with mature adult audiences in mind. Ubisoft’s Bound in Blood delivers the stunning visuals of an epic Western film in one of the season’s best first person shooters. The back story of the McCall Brothers and their exploits are given the spotlight. At the end of the day, it’s a fantastic looking game where the setting holds as much weight as the story and action. Until these games are in 3-D, there’s no topping the big screen experience, but there are a few cases, like the latest Ice Age game, where the home edition will continue to hold a younger audience’s attention well after the credits. Laurence Scott wishes from time to time they’d make a video game for movies like The Hangover.